As with all my recipes, I use organic, non-gmo ingredients. Don’t worry, if you prefer to use conventional ingredients they’ll work too! So why would you want to make your own cream of mushroom soup? We don’t use processed foods any more. This meant I had to come up with a recipe for cream of mushroom soup. The stuff in the can is of course processed. 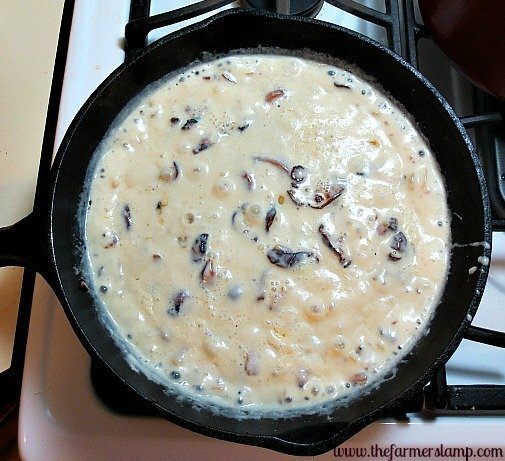 Cream of mushroom soup is a major part of many casseroles. What would the holiday meals be without it? The homemade version is so rich and dreamily, creamy. The taste and texture it gives my casseroles makes them better than ever before. Every time I serve it to the boys, they still remark how funny it is that I would make my own cream of mushroom soup when before I didn’t even like mushrooms! The smell of the stuff in the can made me gag, I hated it. We made some major life changes and moved to an organic, non-gmo diet. 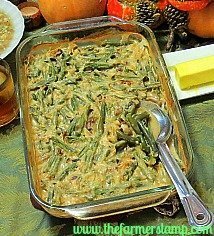 The first concern voiced was, “What will happen to the green bean casserole?” I had to come up with a way to make cream of mushroom soup! Once I discovered how incredibly fast and easy it was to make my own (I just can’t say “cream of mushroom soup” one more time!) I can’t believe I ever even thought about buying it in a can. We use it all year in various dishes. I’ve even added it to recipes I wouldn’t have used it in before. I add it to left over turkey for a creamy gravy. We pour it over hot biscuits, rice and fettuccine noodles. When added to sauteed garlic shrimp and served over rice you have a smile winning, heart warming meal. Serve with a salad and homemade buns on the side. Besides the taste of the homemade version, there are the health benefits of making it yourself. You avoid the preservatives, additives, and other ingredients of the store bought version. If you make it with organic, non-gmo ingredients, you’ll have an even healthier soup. With all the cooking involved with holidays, I like this recipe because it can be made three days in advance. I wanted to share this recipe with you in the hope that it might help you make your meal just a little more special. The reward of course will be the “Mom, what did you put in this? It tastes so good!” Trust me. 1)Melt butter in skillet and saute` onions and mushrooms until onions are tender. 2)Combine 1 cup of milk and the cornstarch. Stir well to dissolve the cornstarch. Be sure to stir the bottom of the cup so that you get it mixed well. 3)Add chopped garlic to the skillet and saute` for about 3 minutes. Just to release the garlic oils. 4)Slowly add the cup of milk with cornstarch to skillet and stir well on medium heat. 5)Add the remaining milk and cream stirring well and let this boil until the desired thickness is reached. I buy mushrooms on sale and dehydrate them. They work really well in this recipe. Use more milk to make a thinner soup. If you don’t like the richness of heavy whipping cream, or prefer not to use it, just use milk and cornstarch to thicken. This recipe can easily be adapted to whatever amount of soup you need, just increase the ingredients as desired. The soup will keep in the refrigerator for a week – 10 days. I store mine in a glass jar. So what do you think? Easy, huh? I can’t wait until you taste it. Be sure to let me know how the cream of mushroom soup (there, I said it again) turns out for you. Share your tips with us in the comments. You’ll be delightfully pleased at how much richer it makes your casseroles and holiday meals. Remember you can always Contact Me to share any ideas, questions, suggestions, or just to say hi! I’m here to help in any way I possibly can. Could I make Cream of Chicken or Cream of Turkey with this recipe by substituting the mushrooms? Hey Karin, Thanks for stopping by. Yes, you can substitute to make any “cream of” soup you’d like!